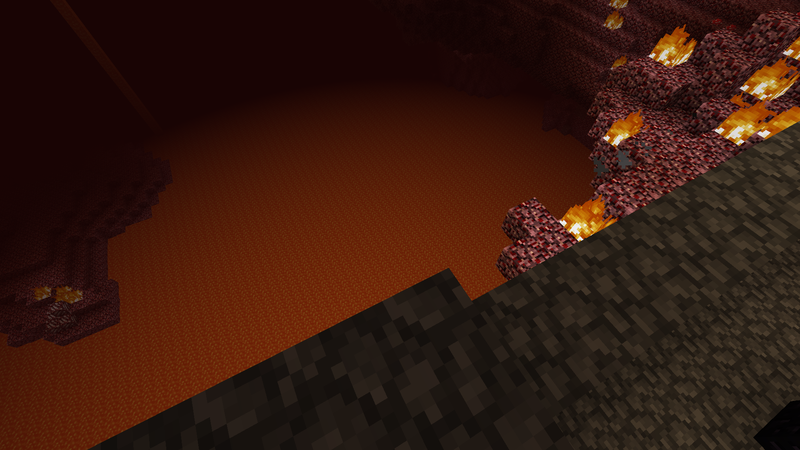 The lava filled world of The Nether in Minecraft is a very dangerous place. From the moment you enter, you find yourself exploring islands filled with nether rock and endlessly burning fire. If you are lucky, all you are greeted with are the “friendly” zombie pigmen that travel in packs. If not, you’ll run into the dreaded Ghast, a sad-looking creature shooting fireballs at you. To an outsider, it may sound like a worthless place. Why would anyone want to venture into hell? There are many uses for The Nether. The rare Nether Wart can be found there and taken back to the over-world where it can be farmed like any other crop. Nether Wart is used to make potions. One in which can be used to cure zombies. It can be found in the large fortresses found in The Nether. My most recent goal, however, has been to find a way to travel from my mining company to my keep on my island. What is interesting about the way the game designers created The Nether is that one can use it as a fast travel method. Eight blocks in the over-world is equal to one block in The Nether. That means that I can use the dangerous hellish world to travel much faster than my old method. Before, I had to enter my mine and use my cart system until I reached the end of a tunnel that leads to the surface. It connects to a dock by the sea where I then must travel by boat to my island. This process takes several minutes. In-game, that translates to a big chunk of the day for my character. Plus, I can only make the trip during the day. After doing a little research, I discovered that I could use nether portals to travel long distances from two points in the over-world. To do this, I had to obtain the coordinates of my mine and my keep. If you press “F3” you can get them. I first tried just making a second portal at my mine and entering. The game tried to set it up, but the second portal was too close to my first portal in the nether. This messed up the portals. Both my mine portal and my town portal led to the same spot. I ended up taking down the second portal in The Nether and moving it. Apparently you can set up a manual connection by taking the coordinates of your over-world portal and dividing that by 8. So, say your over-world portal is at 80 and 8 (I believe that is X = 80 and Z = 8). You would then need to venture into The Nether and find the coordinates of 8 and 1. Build your portal there and you will have a working link. Just make sure that you activate the second portal you have in the over-world, but DO NOT enter it. Go back to your original over-world portal and find the right spot in The Nether from your original portal. The biggest problem I had when I first entered The Nether were the Ghasts that would pop up and attack me. They deactivated my portal with fireballs. This would leave me stuck in the world until I lured the ghast to attack the portal again. That’s why it’s a good idea to have extra flint and steel around so you can reactivate the portal. There were times I didn’t have any, because I had died! Suffice to say, you should be prepared before you go there. Once I had my second nether portal in the overworld linked correctly, I had to find a way to travel in The Nether without dying! The only real danger in the open spaces of The Nether, besides lava, is fire. The Ghast is the most dangerous as it shoots fireballs that have an area of effect damage. That means nether rock and sand can be blasted away easily. Thankfully, stone is fireproof. Since cobblestone is the easiest material to obtain. It took several real life hours to build my nether tunnel, but now I can travel from my mine to my home without worrying about being burnt to a crisp!